TIANJIN, China (REUTERS, AFP) - Investigators searched for clues on Friday to identify what caused two huge explosions at a warehouse used to store toxic chemicals and gas at a busy port in north-east China, as foreign and local companies assessed the damage to their operations. The warehouse was designed to store dangerous and toxic chemicals, according to an assessment by environmental inspectors published in 2014. It was storing mainly ammonium nitrate, potassium nitrate and calcium carbide at the time of the blasts, according to the police. A team from the International Atomic Energy Agency's Beijing environmental emergency response centre, as well as 214 Chinese military nuclear and biochemical materials specialists, had gone to Tianjin, the official Xinhua news agency said. Several thousand residents were moved to 10 nearby schools after apartment buildings and homes were damaged, mainly by shockwaves from the explosions, it said. Two fires were still burning late on Thursday. Vast areas of the port were devastated, crumpled shipping containers were thrown around like match sticks, thousands of new cars were torched and port buildings reduced to burnt-out shells, Reuters witnesses said. Foreign companies from across the globe were trying to determine the damage to their facilities in and around the port, a gateway to north-east China. The Nikkei newspaper said windows were broken at Toyota Motor Corp's passenger vehicle assembly plant but no one was hurt. It said numerous other Japanese companies sustained minor damage to their operations. French carmaker Renault said more than 1,000 of its cars were damaged but no staff were hurt. Around 4,000 cars belonging to Hyundai Motor Co were at the site but damage had not yet been assessed, a spokesman said. John Deere & Co, the US farm and construction equipment maker, said several workers who were at home at the time were injured, some critically. President Xi Jinping said those responsible should be"severely handled". A team of nuclear and chemical experts began work on Thursday at the site. The group of military specialists tested the air around the site for toxic gases, with rescue teams ordered to wear protective clothing in the vicinity due to the ongoing risk of leaking poisonous chemicals, Xinhua news agency reported. Environmental campaign group Greenpeace warned that substances from the site could be dangerous, saying it was "critical" that the potential toxins in the air were monitored closely. Rescuers were attempting to remove 700 tonnes of deadly sodium cyanide from the area late Thursday, Communist Party newspaper the People's Daily reported. Wen Wurui, head of Tianjin's environment protection bureau, told a televised briefing that harmful chemicals detected in the air were not at "excessively high" levels. A lack of answers as to what caused the blasts has reinforced questions about standards in the country, where campaigners say lives are sacrificed on a lack of respect for safety and poor implementation. A panel of officials at a Thursday press conference were peppered with questions about what chemicals were in the tanks that exploded, but they refused to provide details, and the briefing ended abruptly with officials rushing off stage. "Clearly there is no real culture of safety in the workplace in China," said Geoffrey Crothall, spokesman for Hong Kong-based China Labour Bulletin, which promotes worker rights. 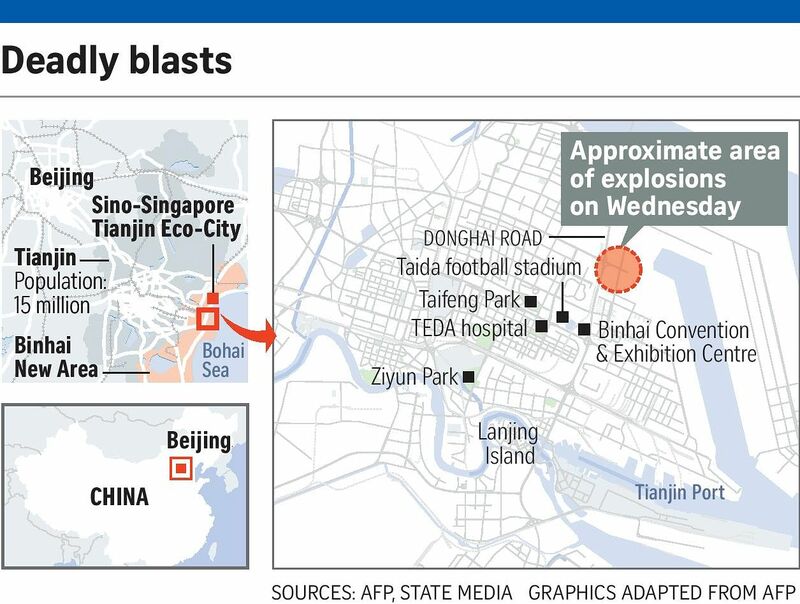 Zhang Yong, the head of Binhai New District where the blasts occurred, told journalists only that "before the explosion, locals saw the fire and reported it".